The free press tradition, in which newspapers and pamphlets expose government malfeasance, goes back to early 18th century England. Among the periodicals that skewered high government and Anglican church officials was a weekly English newspaper, The Independent Whig (1719-1720). Written largely by John Trenchard and Thomas Gordon, (of future Cato’s Letters fame) the Independent Whig exposed and ridiculed with exquisite snark, the divine right of kings, the established church, and those who grew wealthy from government corruption. Trenchard and Gordon’s popular columns were endlessly reprinted in America, well into the 1750s. From them, colonists learned more of the foundations of free government and the elements of John Locke’s Two Treatises of Government. Scorns all implicit faith in the State, as well as the Church. The Authority of Names is nothing to him; he judges all Men by their Actions and Behavior, and hates a Knave of his own party, as much as he despises a Fool of another. He consents not that any Man or Body of Men, shall do what they please. He claims a Right of examining all public Measures and, if they deserve it, of censuring them. As he never saw much Power possessed without some Abuse, he takes upon him to watch those that have it; and to acquit or expose them according as they apply it to the good of their country, or their own crooked Purposes. While I do not attempt here, to attribute the writings of Trenchard/Gordon to particular clauses of our Constitution some decades later, they are certainly part of the aura of republicanism that soon gathered strength, subsequently burst into revolution in 1776, and culminated in a new form of free government in 1787. Scorned the passive submission inherent in implicit faith to a national government and its allied church, our Framers utilized their God-given reason to design a governing form that discouraged tyranny through the division of legitimate powers in a framework of three co-equal branches and the states. Rejected a state-sanctioned church, our Framers likewise prohibited an established national church. Wasn’t impressed with noble birth and titles, the anti-republican institutions of a hereditary nobility have no place in America. Rejects divine right to rule, the Constitution acknowledges sovereignty in the people. Claimed the right to open government, to know its deliberations, the American congress keeps a public journal of its proceedings, while the executive branch is supposed to be open to Freedom of Information Act inquiries. Knows that keeping free government requires an ever-vigilant society, an open and free press along with provisions to impeach, remove, and prosecute malefactors is essential. Through a newly won freedom of the press, Trenchard and Gordon unknowingly reinforced the American cause of free government some fifty-five years later. Three hundred years after an emergent free press encouraged the spread of John Locke’s noble and uplifting theories, the American media of 2016 works toward the destruction of the principles that set them free. Instead of exposing high crimes, major media conceal and partake of them. America is an occupied nation, a nation occupied by hostile Leftist nostrums that reject The Enlightenment and its embodiment, the United States Constitution. Trenchard and Gordon are among the silent partners of the American tradition that clamors for renewal of free government, that happy condition wherein government respects and protects the unalienable, Natural Rights of the nation, and makes no law without its consent. 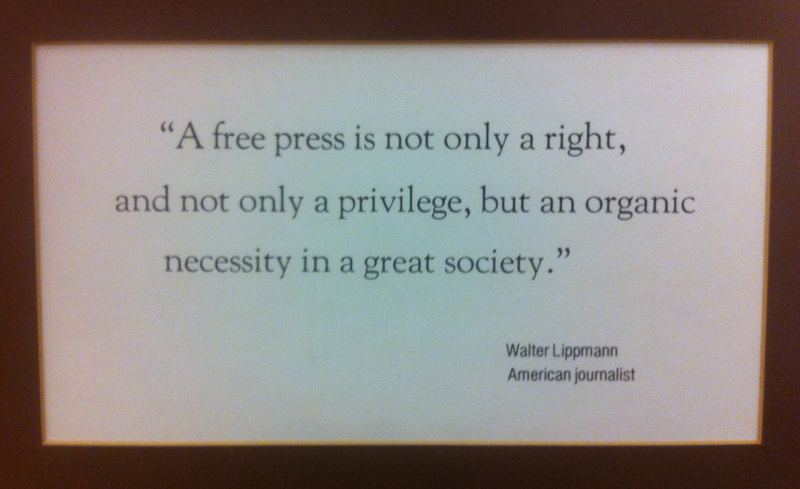 Free government is impossible without a free press. Reference: Robbins, C. (1968). The Eighteenth-Century Commonwealthman. Indianapolis: Liberty Fund. Pages 115, 120. Maybe it’s the weather, maybe it’s the hour of the day, maybe it’s just the dismal truth of your words dragging on my mood, but I don’t see a solution to this. They are protected. They may lie to us, and may now openly collude to do so with little or no reprisal. There is no proposal that I can think of to rally behind that wouldn’t conflict with the First Amendment, that wouldn’t abridge their freedom… to lie. I suppose we do have some tools to work with… an “alternative” press, maybe a viral #hashtag rebellion on social media, and then we can always hope for eventual retaliation by the free market. The country needs another Trenchard, Gordon… and Dodsworth! Thanks. I believe the Second Amendment is to personal self-defense as Article V is to society. Yes, a long shot, but certainly necessary. My political daydream envisions President Trump’s support for Article V. I suspect he will realize that his 2017-2025 presidency might be just a bump in the road to tyranny. A good reminder of the task and honor accorded to the media and almost ironic as this comes on the heels of the New York Times swearing to report from now on. Perhaps the Times might do well to hang the Trenchard and Gordon quote on its doors, not allowing any employees in until they have read it aloud. Thanks again Rodney for all you do. This one was a little harder for me to absorb. But no question the media has for a very long time been fast forwarding the progressive cause. It will definitely be interesting to watch the further demise of the MSM as more and more seek their news elsewhere. God bless you and Sherry. May God bless you as well. Respect for the Jurassic media has plunged in tandem with public respect for their boss, the democrat party. I love it. These times of instant messaging allow us to publish freely whatever we choose to proclaim. It means we as readers must be vigilant in learning about history and filter today’s news through the lenses of experienced guides. There’s nothing much that is new under the sun. We can understand the difference between lies and truth by studying the past out of the best sources. With that education, we’ll be in a much better position to judge current media presentations than without it. Rodney, I love the historical perspective you attach to our founding and why the Framers crafted the Constitution as they did. I have learned so much from your writings. It’s a very difficult undertaking to combat misleading or untrue information when we must stay true to our First Amendment. Progressives have no problem lying because to them the means justify the ends. None of the main media outlets, including Fox News, will consistently or ever hold them responsible for their outright lies or mischaracterizations. I find myself yelling at the TV or, as is happening more often, not tuning into so called 24 hour news stations. This cabal of progressives have to be made irrelevant by taking away or minimizing their greatest source of power, an overreaching and powerful government at all levels. It was a no brainer for me to join the movement started by The Convention of States Project to more clearly define and limit the scope and power of the Federal Govt. We are now over two million volunteers and counting. Learn more at conventionofstates.com and sign the petition. Our free government tradition is something to be very proud of. Another great article Rodney. Thanks for all your hard work. Our President-elect has struck a mighty blow to the main stream media, making them look like fools. The freedom of the press will be preserved by Patriots like you exercising it vigorously in service to the truth and our great republic. He treats the media with the disdain they deserve.